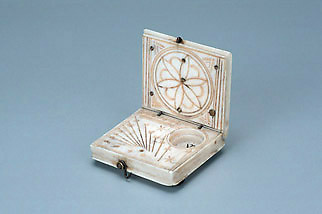 This dial is distinguished by its size: it is probably one of the smallest surviving diptych dials, and is certainly the smallest in the collection of the Museum of the History of Science in Oxford. It is made in the form of a book with brass bun feet, and consists of a compass and of a pin gnomon dial marking Italian hours. The maker's mark is punched on the outer side of the lower leaf but has not been identified.